This September, the country is going to witness two arduous, high endurance marathons which will not only test the physical strength, but also challenge the mental strength and determination of runners. Besides the uphill challenge that they throw to the runners, both the marathons have a few other points in common. Both are accredited by AIMS (Association of International Marathons and Distance Races). The advantage of being accredited by AIMS is that the races are listed in the AIMS calendar of events, which attracts good competitive runners. Also, an AIMS accredited race serve as a qualifier for major international marathons across the world and maintain internationally recognized standards. Both the marathons will attract domestic runners in their best physical condition, maintaining a regular work-out regime, as well as international elite athletes and running enthusiasts. While, one of them will be held in the Western Ghats (part of the Sahyadri range of forests in Western Maharashtra), the other one will be held in the Karakoram mountain range. Both are in their 4th edition and will be held on two back to back Sundays. Finally, both the marathons give runners an opportunity to live their passion for travel as well as sports! If you are a running enthusiast, I am sure these facts are enough to guess the names of these popular marathons:- They are The Satara Hill Marathon and The Ladakh Marathon. The Satara Hill Marathon (SHHM) will be held on 6th September 2015 through the hills around Satara in Maharashtra. The marathon gives runners a chance to run alongside waterfalls, through clouds, on the majestic Western Ghats with spectacular scenes of natural beauty. This marathon has two categories, 21.1 km half marathon and 7.5 km race. It also has a non-competitive and non-timed run called Dhamaal Run. Runners can make a visit to popular tourist destinations like Kas Plateau of Flowers (a UNESCO World Heritage Site), Mahabaleshwar, Panchgani during their trip to this marathon. The SHHM is organised by the Marathon Association Satara, which is a Non-Profit Organisation, formed by running enthusiasts from the local running community of Satara. 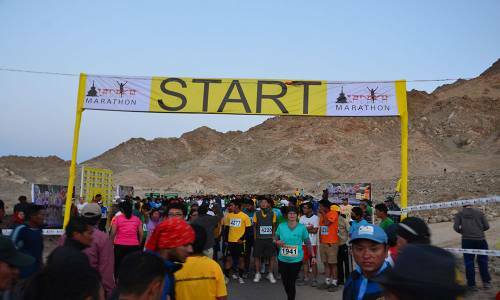 The Ladakh Marathon is one of the world’s highest marathon. It gives runners a unique opportunity to run through a high mountain desert region in and around Leh Valley at an altitude of 3524 m (11562 ft). This marathon will be held on 13th September, 2015 and has four categories, 7km race, half marathon, marathon, The Khardungla Challenge – 72 km ultra-marathon. To avoid altitude sickness, it is recommended for runners to reach Leh a week to two weeks in advance. Runners can enjoy the beauty of Ladakh during their trip to this marathon. The event is organized by Rimo Expeditions, India’s leading Adventure Travel Company with the support of the Ladakh Autonomous Hill Development Council and the Ministry of Tourism & Culture, Government of Jammu and Kashmir.